Just an illustration I think I’ve finally finished, from that second project I kept alluding to down below. This one, as simple and small as it seems, has shown me neither mercy nor quarter. If there’s a difference. Though it means nothing to you, we have here Gwen Hopkins in front of the Icelandic tower of mad Doctor Rognvald. She’s about to deliver his… toaster. Honest. I wouldn’t make that up. Okay, in point of fact I did make that up, but I didn’t make up the fact that I made it up. Previously. In good faith. Here’s something I don’t often do. No, not the rocket. I often do that. Nope, what I’ve done is to go back to an old rocket model I made back in 2002 (I think!) and I’ve reworked it in a higher resolution and with higher resolution textures and better materials – so it’ll look like it belongs in the same universe as my more recent rockets, characters, and other objects. It was an interesting process. My recent models and materials are way, way better than what I was doing seven or so years back – and processors are so much faster – and addressing larger amounts of memory is so much easier – that I spend a lot more resources these days on an object like this. So whereas the old model used a bit less than 80,000 polygons, the new one weighs in at over 417,000. There’s Moore’s law for you. But quite a bit of the difference is in my self, not in my stars. I did see clearly that there was a lot about 3DS Max materials that I didn’t know yet when I built the first one. 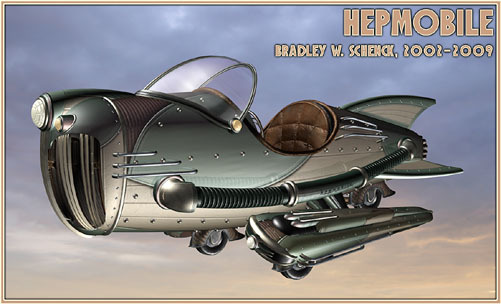 The Hepmobile, I’ve found, is a vintage rocket in Retropolis. Although it always seems to be 2039 there, the Hepmobile is older than that: it’s pretty much the Volkswagen Beetle or the Morris Minor of the retro future. Everyone’s owned one, and they just keep going forever with a little TLC. They’re still produced (in 2039) in limited numbers – mainly because some agencies, like the Retropolis Civilian Conservation Corps, continue to use them for their official vehicles. And how do I know that? Well, for now, I just know. 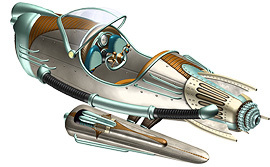 As I write, the countdown timer on its web site tells me that less than 13 days remain till the arrival of the Raygun Gothic Rocketship at its destination, which is either Burning Man or someplace a bit more interstellar. If you’ve missed it, this is an impressive feat of construction – at forty feet tall! 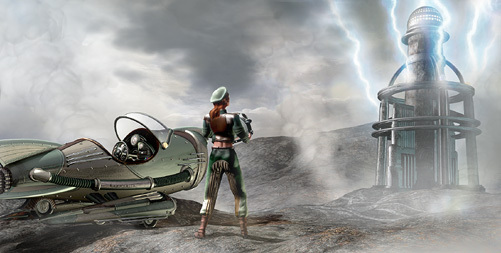 – by the same group of demented designers that brought us the Steampunk Treehouse. Much as I like treehouses, this one’s probably a little nearer the mark for me. The Raygun Gothic Rocketship is intended to creatively explore our ideas about evolution and technology as they relate to our notions about progress and The Future. This project exists at the blurry edge where science and fiction blend and become both our reality, and the stories we tell ourselves about that reality. We though this would be so cool to make! But we’re afraid that you won’t respect us unless we come up with some sort of ridiculous prevarication that makes us sound all… sort of intellectual, you know? But disregard the pretensions. It is a richer world that has scenes in it like the one below. A little Lewis Wickes Hine, a little Buck Rogers. Just the way I like it. And with this post I’ve caught up a bit with the cool things that have been piling up while I worked away almost tirelessly in the Secret Laboratory: in the past three days I’ve written posts about robots, ray guns, and rocket ships. It’s the trifecta of retro futurism! Steven Melendez is another visitor to the Retropolis Transit Authority who sent me a link to this cool video of the raygun he built recently. Neat! He says he built it "…incorporating scratch building, laser engraving, and conventional machining with a mill and lathe. It has an auto enamel copper and silver finish with patina." And it is indeed sweet. As far as me updates go, I have at least mailed off a mysterious packet for one of those two super secret things I’m doing, though odds are I’ll need to do something else before the whole shebang is ready for its pitch. Back to super secret thing #2, I guess. More anon. I’m still stapled to my desk, but cool things keep flying out of my monitor at me even though I’m doing my best to ignore them. I’m just that dedicated. Retropolis Transit Authority customer Tim Hammell sends me this link to some wonderful retro robots built out of found objects from thrift stores and, for all I know, time traveling midden heaps – they’re by Lipson Robotics, and I envy Tim because he’s the happy owner of one of them. The sculptures are assembled completely with nuts and bolts, which seem so much more fitting than adhesives. It’s as though they’re who they are, through and through, and I like that about them. Come to think of it, I like that about anybody. The robots are up to 30 inches tall, and weigh up to 20 pounds. Lipson Robotics is the brainchild of an animation director and producer with years of experience on stuff you’ve probably seen. But I prefer to think that his true calling is scavenging for robot parts, and putting them together. It’s destiny.